Running back Brendan Dunleavy (42), of the Fairfield Giants, takes a handoff from quarterback Nick Morris (7) in football action last weekend. The Fairfield Giants Mitey Mites Juniors beat the Amity Spartans 24-12 on Oct. 20. Sean O'Neil and Tyler Bartlett each had rushing touchdowns for the Giants, and Cooper Anderson rushed for key yardage. Rogan Kane provided a steady hand at quarterback. Joe Macri, Parker Pasmeg, Matty Mitchell, Andrew Reynolds, Nolan Ryan, Trevor Scholz, Ryan Faris, Jack Balsano, Paul Barnaby, Jack Ransome and Charley Moore were stalwarts on defense. The Mitey Mite Seniors lost to the Seymour Tigers 18-6 on Oct. 20. Seymour took the opening drive 55 yards for a touchdown and conversion for 7-0 lead, which is how the first half ended. Seymour would add two late scores in the fourth quarter. Giants standouts were running back and linebacker Jack Melbourne, quarterback Jason Vasquez, Thomas Kramer (RB/LB), two-way lineman Beau Dehler and running back Jaden Cherry. The Fairfield Giants Junior Pee Wees completed their regular season by shutting out the Amity Spartans 25-0 last weekend. Running back Michael Innaimo went off tackle 45 yards to give the Giants a 6-0 lead. Tommy O'Connell scored on a 40-yard run in the second quarter, which made the score 13-0 at halftime. Quarterback Nick Morris sprinted 55 yards for a score in the third quarter and a 19-0 lead. Morris later rolled right and connected with tight end Finn Donelan for a 40-yard TD strike. Cornerback Gavin Toth and safeties Grady Barlett and Jed Keresey allowed three completions for Amity. The defensive line recorded nine sacks and made two fumble recoveries. Other standouts were AJ Montgomery, Terrence Falvey, Aaron Sepot, Charlie Wilcox, Sean Mockler and Freddy Cappossella. 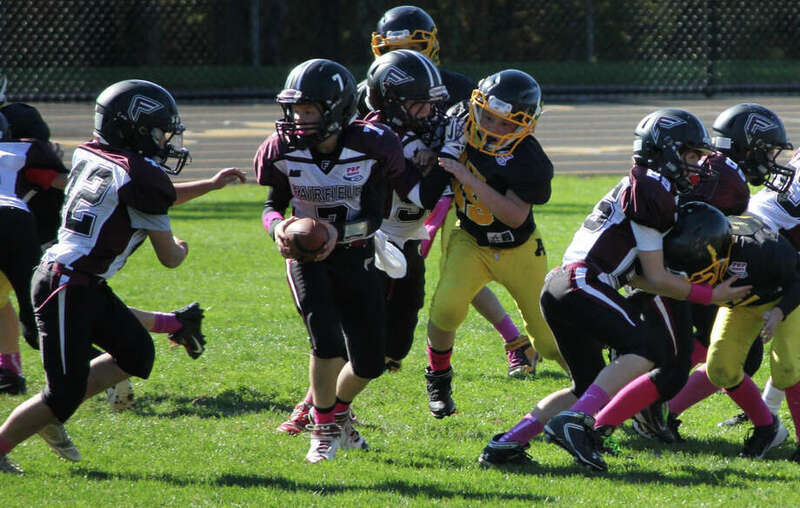 Fairfield plays Trumbull in the quarterfinals this weekend in the Southern Connecticut Pop Warner playoffs. Fairfield closed out the regular season by defeating Seymour 29-7 last weekend. Finn Duran went 45 yards to the end zone and Henry Houghton punched in the conversion to open the scoring. On the Giants next possession, Aidan Wykoff ran 25 yards and added the point-after for a 14-0 lead. Then Henry Houghton plowed his way for the Giants' third score of the half, and Brian Kiremidjian added the kick to put Fairfield up 22-0. Seamus Malloy added an interception for Fairfield. Owen Cirilli opened the second half with Fairfield's second interception of the game, which led to another Duran touchdown. Kiremidjian ran in the point-after to close out the scoring. Over eight games, the Giants' defense has allowed 44 points and has recorded numerous takeovers. Following a first-round bye, the Pee Wees will be in the playoffs in early November. The Fairfield Giants Junior Midgets concluded their regular season with a 6-0 win over the Derby Red Raiders last weekend. The Giants will travel to top-seeded Newington Saturday at 2 p.m. in the playoffs.